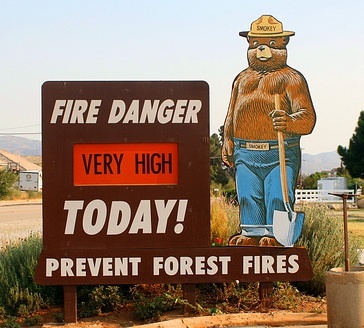 The living symbol of Smokey Bear was an American black bear three-month-old cub who in the spring of 1950 was caught in the Capitan Gap fire, a wildfire that burned 17,000 acres (69 km2) in the Lincoln National Forest, in the Capitan Mountains of New Mexico. Smokey had climbed a tree to escape the blaze, but his paws and hind legs had been burned. According to some stories, he was rescued by a game warden after the fire, but according to the New Mexico State Forestry Division, it was actually a group of soldiers from Fort Bliss, Texas, who had come to help fight the fire, that discovered the bear cub and brought him back to the camp. Originally called Hotfoot Teddy, his name was changed to Smokey and he became a living symbol, ensconced at the National Zoo in Washington until his death in 1976. His remains were returned to Capitan, New Mexico, where there was a museum and a funerary monument in his honor. 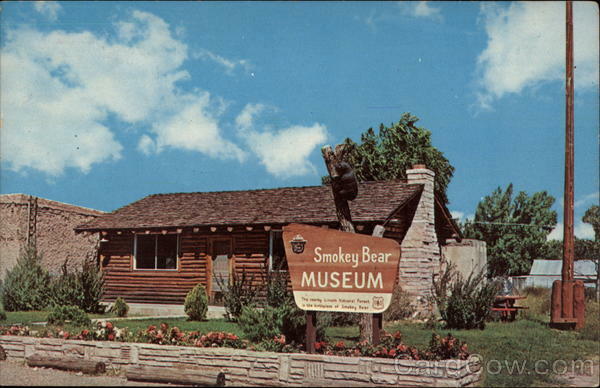 The museum is still there, as well as a Smokey Bear Motel and a Smokey Bear Restaurant. We visited in 2003, and plan to drop in again to pay our homage to Smokey. Martine has a special devotion to Smokey. She has a special 50th anniversary stuffed Smokey Bear, as well as a zipper pull. Our refrigerator has two Smokey Bear magnets. There is even an Idaho company called Woodland Enterprises, which Martine has visited and which sells Smokey Bear (and Woodsy Owl) memorabilia. We shop there annually for gifts. So Capitan, New Mexico, you can expect us some time this summer.